Facts About Fat: The Good And The Bad | Dynamic Physiotherapy & Sports Injury Clinic Inc. Fat is one of the three macronutrients that are essential to good health. But perhaps no other nutrient has been as mischaracterized in popular media as fat. In the past, fat has been linked to heart disease and high cholesterol. This has led many to avoid it at all costs. But fats play significant roles in maintaining your health. Understanding the facts about fat (both the good and the bad) will help you make sense of the information that you’ll find online and in health publications. Fat is essential to a healthy diet. It isn’t fat itself that leads to an increase in weight. It’s the consumption of excess calories, which are then stored as fat, that leads to weight gain. So getting all of the health benefits of fat comes down to finding a balance between eating the right amount and types of fat. Fat is present in animal foods, such as meats and dairy products, as well as vegetables and other plant foods. Plants use fat as an efficient way to store and use energy when sunlight levels are low. Eating the right amount of fats for your metabolic needs is the key to maintaining good health. Saturated and unsaturated fats have unique properties that must be considered for health. In general, saturated fats are found in animal foods. Cheese, milk, eggs, and butter are just a few examples. Unsaturated fats typically occur in plant foods and are commonly consumed through oils, seafood, and nuts. Fat has more calories per gram than proteins and carbohydrates. This makes it an efficient form of energy. Fats are consumed through the foods we eat, and they can be created by the body through the use of other nutrients. Any excess calories that are not used are stored in fat cells. Fats allow for the proper function of the nervous system and support the health of the skin. Many of the hormones that are essential to the body are formed from fat, and it’s a key factor in transporting vitamins D, E, A, and K.
Omega-3 fatty acids have been shown to be useful in the treatment of mental disorders and in reducing the risk of diseases such as cancer and heart disease. They help to reduce inflammation of the joints and skin and help regulate mood. Natural fats are more beneficial than artificial fats such as trans fats. Trans fats are produced through hydrogenation. This changes the structure of the fat molecule and it is commonly found in commercially processed foods. Natural and healthy fats can be found in quality whole foods that have been minimally processed. The quality of the source of any food must be considered when determining the merits of the fats that it provides. 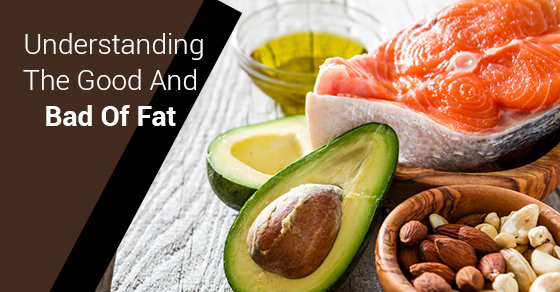 Knowing the good and bad about fats is critical to maintaining optimal health. Understanding the roles that fat plays in the body ensures that you make the best choices to support your long-term wellbeing.